Rejection letters are had to write. The accurate selection of words and the tone of the language are decisive factors for the outcome of the write-ups. These are essential for your organization as you have to refuse to multiple applications at a time. However, you need to be polite and diplomatic. 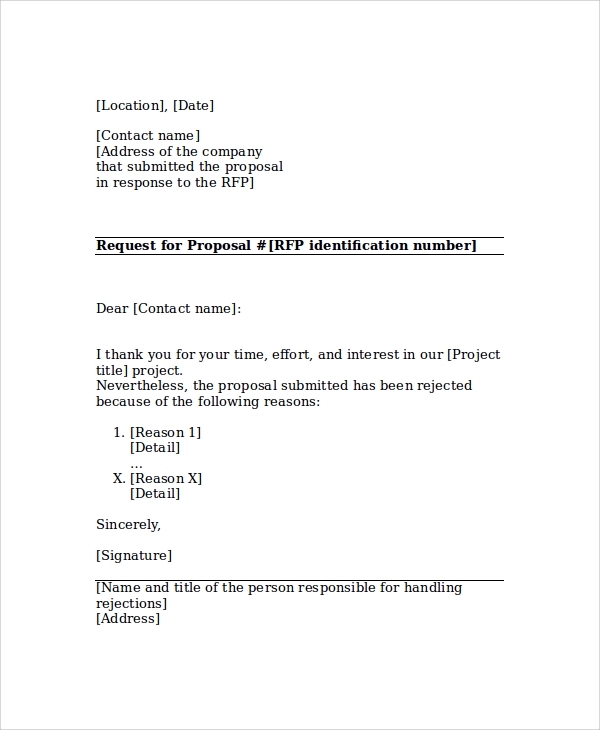 Here are some Sample Letters that will help you to write sophisticated rejection letters. You can follow a Rejection Letter Sample when you format the letter. In these letters, the first paragraph contains the reference to the application of the student. The second paragraph includes the reason for rejection. The last paragraph appreciates the efforts of the candidate and ends with a positive note. 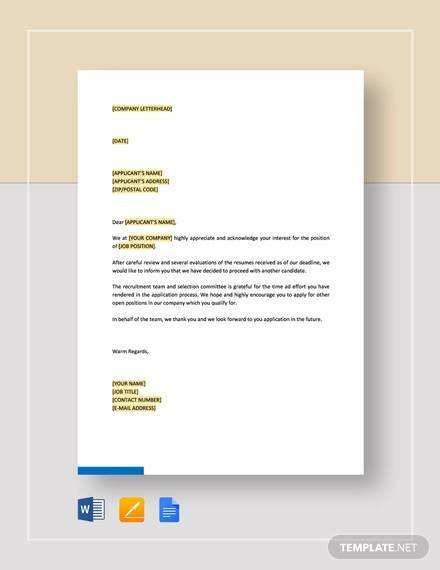 These letters are written by employees to the company after they are rejected. 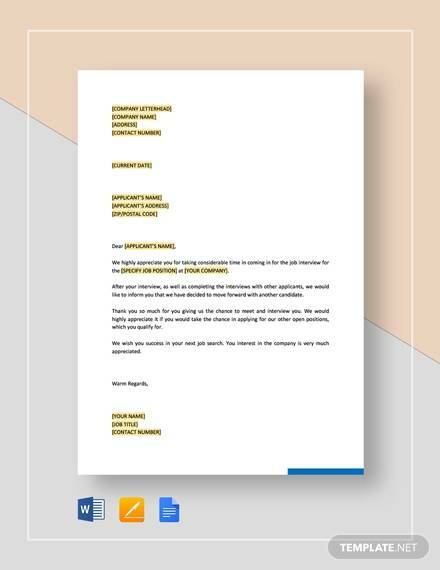 It contains a note of thanks and states that he/she was ready to serve the company if there is any opportunity in future. You may also see the Rejection Letters After Interview. 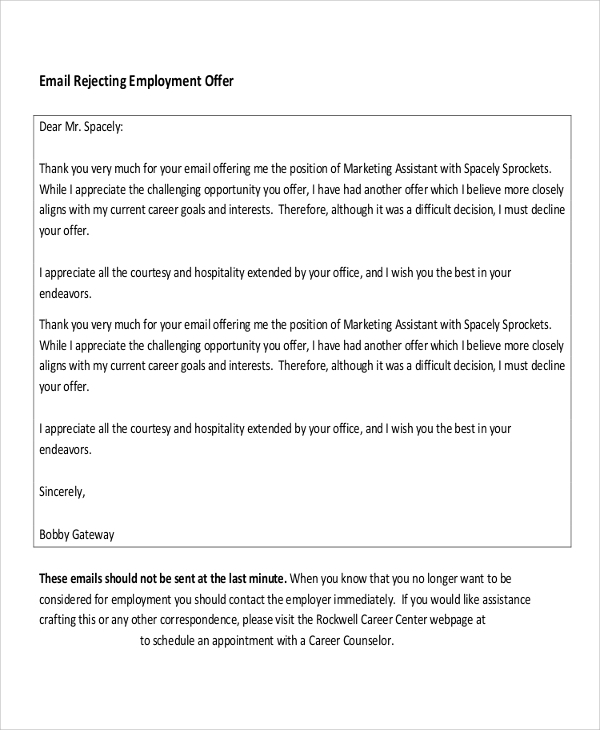 This is a well-formatted rejection letter where the company conveys the message of rejection to the employee. Three paragraphs have been developed for conveying the message with sophistication and respect. Why are Rejection Letters so Important? It is easy to say yes and accept the facts than to refuse. Well, in the same way, you will find it a bit difficult to maintain good relations with the people even when you refuse what they want. 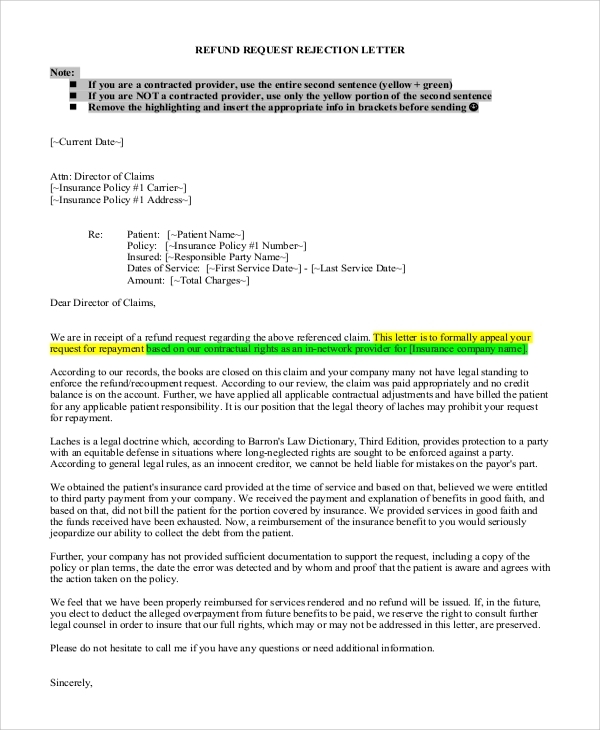 When you write Refusal Letters to the applicants, you need to maintain a good relationship with them, as you may require them sometime in future. Apart from this, a company has a distinct culture, and hence, it is important to preserve it. 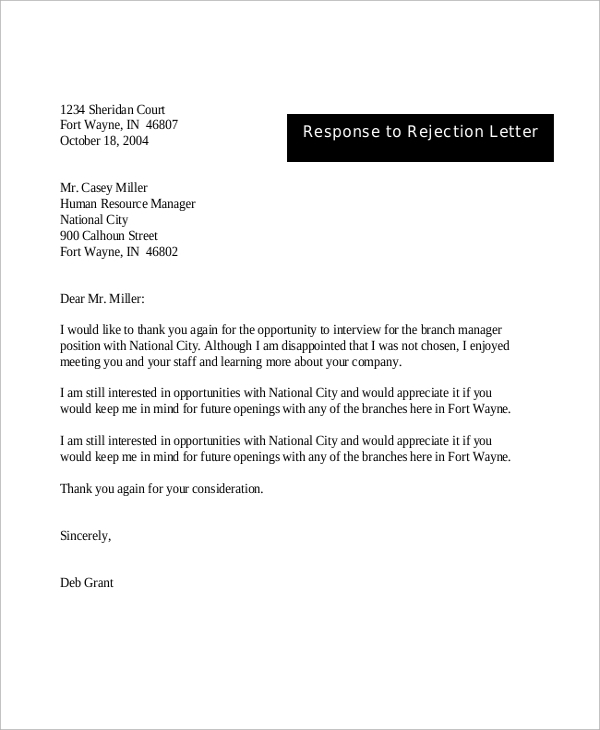 A rejection letter should not include any harsh words or contain anything that is likely to undermine the reputation of the company. This is a rejection letter that is addressed to the employee, with the name and address at the top. The reason for rejection is explained in the letter. It thanks the applicant for making the efforts. In this rejection letter, only one paragraph has been used. It delivers the crux of the message, with a little explanation. The entire letter consists of three to four sentences. 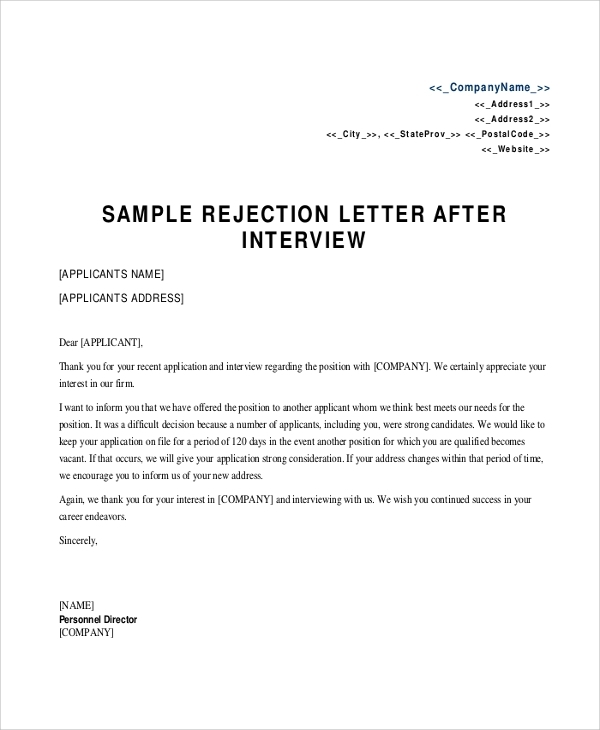 You may also see the Applicant Rejection Letters. 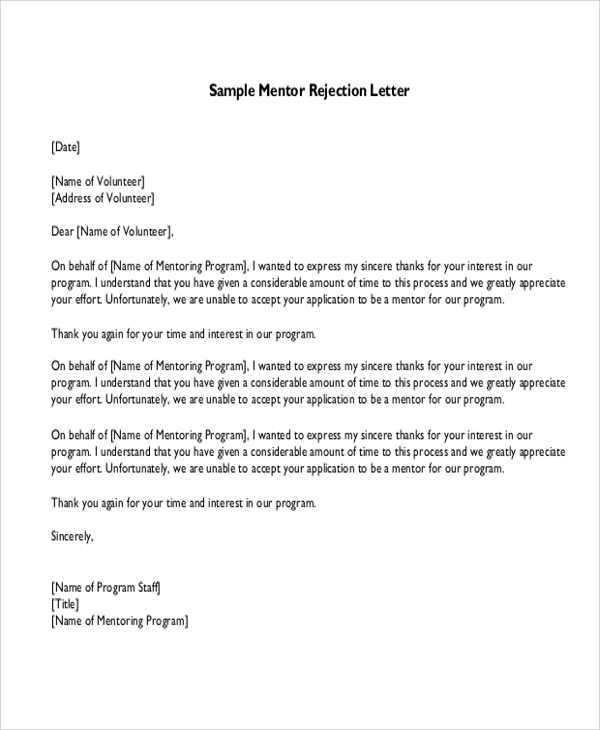 How to Structure a Rejection Letter? A rejection letter should be short and concise. However, it must explain the reason for the rejection. You should include three paragraphs in these letters. The first one should introduce the letter to the receiver. It should explain why the letter is being written. 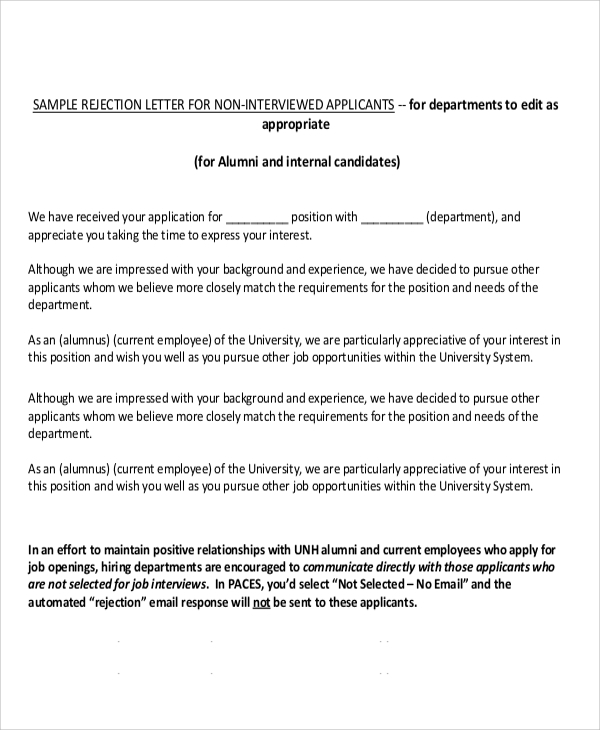 For instance, job Rejection Letters start with a reference to the application made by the student. Then comes the body, where you have to reason up why the candidate is being refused. Here, you can include the fact that the company found his/her skills relevant, but better candidates are available for the time being. In the last paragraph, convey your actual decision and end with a positive note. 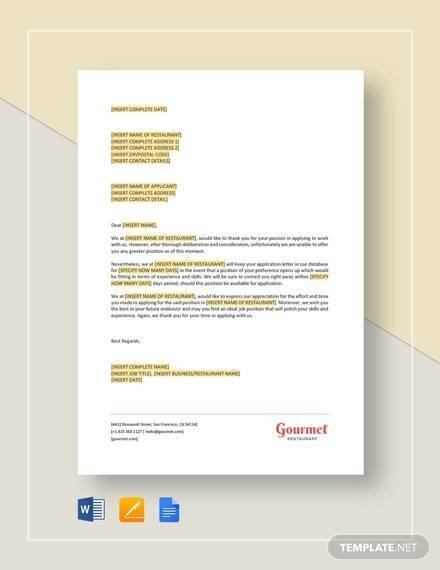 While structuring the letter, choose the words carefully, as a slight change in wordings can distort your message. 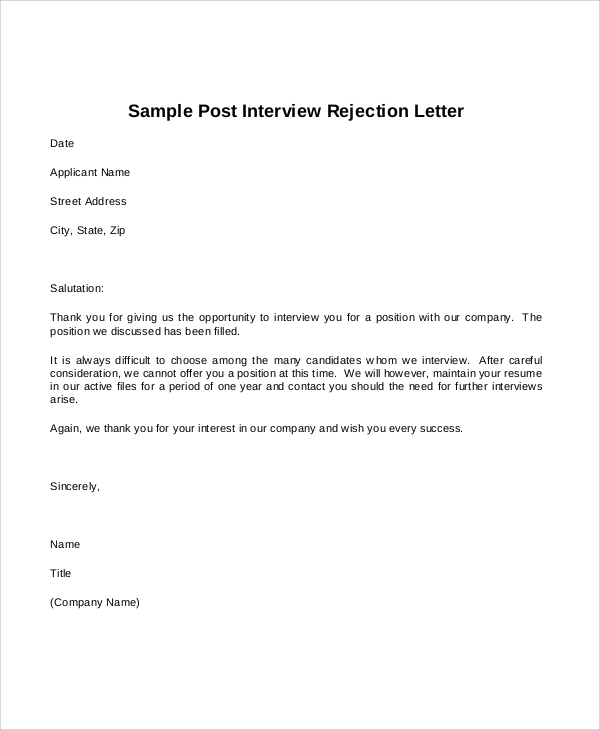 You may browse the website to find different types of rejection letters, including Job Rejection Letters and Applicant Rejection Letters. These will assist you in developing effective rejection letters for various purposes.